In the summer of 2016, I find myself back in my old hospital ward, in the very room where I spent so many days and nights. The yellow room where time never seemed to pass at regular speed. Lars Ardarve and I were both eager to work closely together with the photos for this album, and we bounced ideas back and forth over the phone for weeks on end. 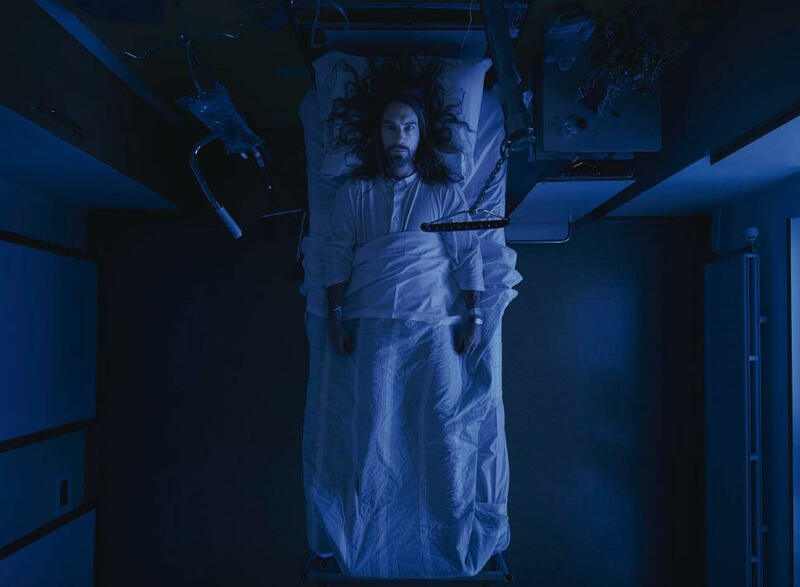 It was Lars who one day suggested taking pictures of me in a hospital bed, from the ceiling, and then make a series of images with me lying in similar positions in other places. I loved the idea, but had to tell him it was totally impossible. I mean, hey, it had been difficult enough for me to get a room at the hospital, even with flesh eating bacteria dining away on my spine. And in either case, for reasons of patient integrity, there was a heavy prohibition against photography in the hospital. I knew this firsthand, since I had been taking a lot of photos myself during my stay, blissfully unaware of this policy. We both agreed that it was a great idea, and that it was a shame it would never happen. Afterwards, Lars told me that this happened after we hung up: his wife Sandra asked him how the call was and what did I think of his idea. Lars replied that I loved it but that it was impossible and wouldn’t happen. Then he paused for a while, before adding, probably with a chuckle: “however, knowing Daniel, I bet he is putting wheels in motion as we speak.” Lars knows me so well. See, meanwhile, on my end, my wife Johanna had asked me the same thing, and why don’t I at least try dropping a short line to Tone Holmås, my main surgeon during most of my hospital stay? This is how I usually go about climbing impossible mountains: I acknowledge that the task is indeed totally impossible, but then I can’t help just taking a few small steps up that first slope. Then a few steps more. And the year 2016 (aka “Garbo”) had been fair and just to me this far. Not easy-going or party-loving as years go, and always with a stern gaze – but we had an understanding. Maybe Garbo would sort this out too? To my astonishment, Tone replied that, yes, the entire ward (and listen to this, will you?) had been temporarily moved for a few weeks, for reasons that I still don’t fully understand (probably much less magical ones than they seemed to me at that point), and the entire floor was empty. Totally. Empty. Seriously, what are the odds? After a few calls and text messages, she had talked to the head of the ward, and gave me the number to a nurse, Veronika Larsson, who could help us with getting in and setting things up. Suddenly, just like that, we were halfway up Mount Impossible. So, fast forward, and here we are, walking into a spooky and echoing version of my ward from two years back. We turn on the lights in the long corridors, and we walk to my old room. Veronika has put in a made bed, just like the one I used to lie in (which is not that remarkable, as they are all the same, but still, it feels oddish). Actually, the room looks exactly as when I left it, as if two entire years have not passed (and trust me, that could very well be the case, knowing how time could stand still in this room). I have brought with me a plastic bag of memorabilia from my hospital days – a few get-well cards from fans, my old hospital ID wrist bracelets (I recall how happy I was to cut them off, how ceremonial it felt, and here I am, putting them back on again). The sense of déjà vu is overwhelming. Veronika helps me with an i.v. for my wrist and then fetches two colleagues, Daniel Karlsson and Carina Jonasson, and together they set up an EKG scene for us. Wow. Everything turns out to be way more realistic and deterministic than we could ever have hoped for. Lars sets up his lights and cameras, and as I change into hospital clothes, the daylight outside the window is starting to fade. The most fitting photo shoot for this album that I could ever have imagined. And as I am lying there in my old room, surrounded by an entire ward of spookily silent, dark and empty hospital rooms, feeling utterly weird and mentally preparing myself for sitting naked in the shower room a few doors down the hall, I send my respectful regards to stern-faced Garbo (even though I baptised her Garbo, I always picture 2016 as an old Katharine Hepburn). Once again, she has sorted things out. I can trust her. She has this wonderfully dry and utterly grim sense of humor.